Here at Balladeer’s Blog we wring down the curtain on Halloween 2017 by revisiting our old friend Jose “Mojica” Marins, Brazil’s notorious King of Horror. 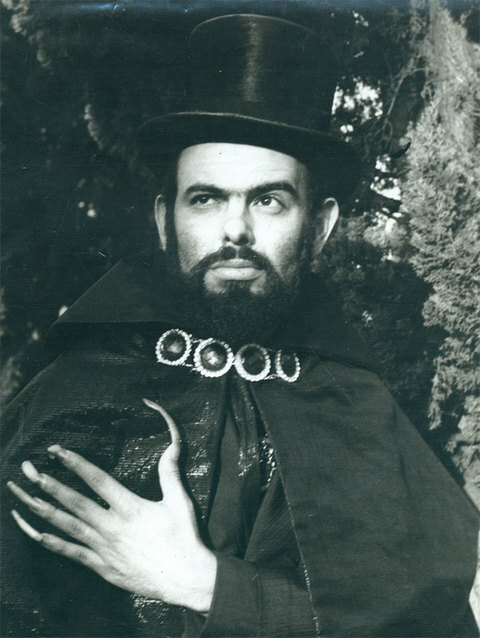 Marins’ most famous character is Ze do Caixao aka Coffin Joe, a figure who belongs alongside Dracula, Freddy Krueger, La Llorona and other horror icons from around the world. 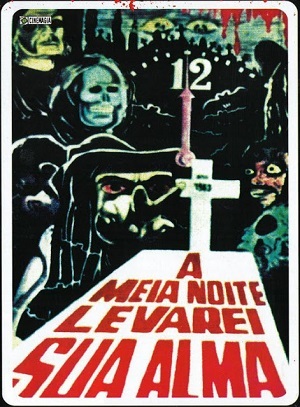 At Midnight I’ll Take Your Soul (1963) – Brazil’s first-ever home-grown horror film was also the very first appearance of Coffin Joe, an undertaker who relishes exploiting and mocking the religious beliefs of the community. The transgressive, hypnotic figure lords it over those he considers to be ignorant peasants and lesser beings. Ze’s reign of terror sees him inflict physical and psychological torture on his victims, including gouging their eyes out with his incredibly long fingernails. The vile but charismatic monster is searching for a superior woman to mate with while killing off male rivals as well as women who don’t meet his expectations. 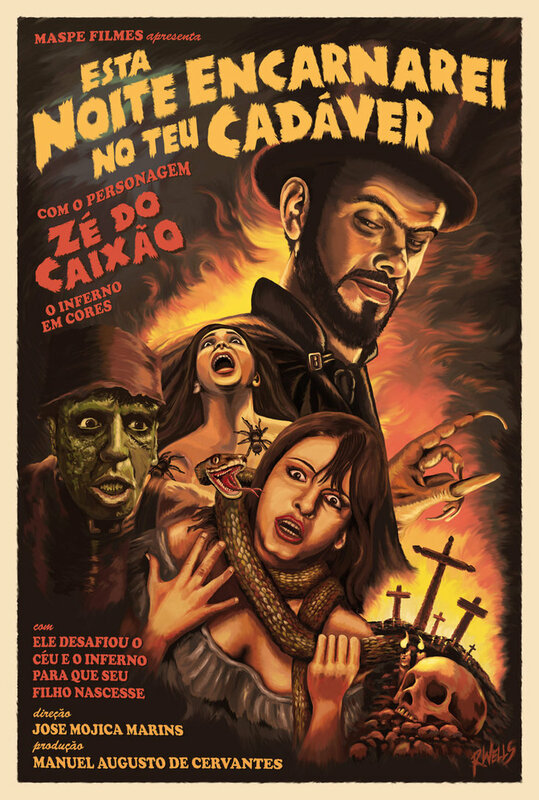 This Night I Will Possess Your Corpse (1967) – In this sequel Coffin Joe is even more powerful and depraved as he subjects Sao Paulo to another reign of terror. Ze is still searching for the perfect woman to bear his child and inflicting all manner of torture on his victims but this time around the viewer is treated to even more of the villain’s bizarre philosophy, which seems to be composed of equal parts Nietzsche and de Sade with a healthy sprinkling of Aleister Crowley tossed in. Irma Hinojosa of Democrats for Trump and Latinos for Trump is yet another member of the real-world League of Extraordinary Women. She is also one of the most vocal figures when it comes to the way Democrats have alienated so many of us by betraying everything they used to stand for. Irma is always in the front lines taking on the fascist animals of Antifa and similar hate groups. She shines at puncturing the pomposity of shallow, uninformed and emotionally unstable celebrities, too. ROSAURA (1817) – Written by Friedrich Fouque. Halloween Month 2017 is dying quickly. Here is another neglected story from the late Gothic Horror period. Rosaura has a fairly unique supernatural premise so that alone should have earned it a wider following by now. No vampires or ghosts or werewolves feature in this tale, but instead a more offbeat kind of supernatural horror. Count von Wildeck packs up his guns and wears his finest clothing for a visit to the castle of Colonel von Haldenbach, whose niece Rosaura he wants to romance. NUMBER ONE GETS KNOCKED OFF – Division Two’s PITTSBURG (KS) STATE GORILLAS hosted the top ranked team in the nation – the defending National Champion NORTHWEST MISSOURI STATE BEARCATS. Not only did the Gorillas defeat the Bearcats 20-10, but this loss ended NW Missouri State’s THIRTY-EIGHT game winning streak. Pitt State led 17-7 at Halftime and stayed on top from there to the delight of the crowd at The Jungle. EASY AS ONE, TWO, THREE – Meanwhile in the NAIA the Top Three teams rolled to victory: The (1) UNIVERSITY OF SAINT FRANCIS (IN) COUGARS dismembered the LINDENWOOD UNIVERSITY AT BELLEVILLE LYNX 70-0 ### The (2) BAKER UNIVERSITY WILDCATS handed a 49-0 loss to the CENTRAL METHODIST EAGLES ### And the (3) REINHARDT UNIVERSITY EAGLES (Should be the Rottweilers) hammered the homestanding PIKEVILLE BEARS 44-21.